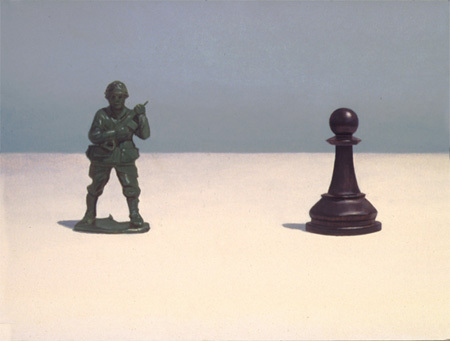 “Is it theme week?” you ask, and I say “No, but it is another artist who finds inspiration in molded army men and creates amazing paintings as a result.” Chris Cosnowski brings social commentary together with humour and adds a touch of irony. He also employs some audio on the site, so turn those speakers down if you’re at work. 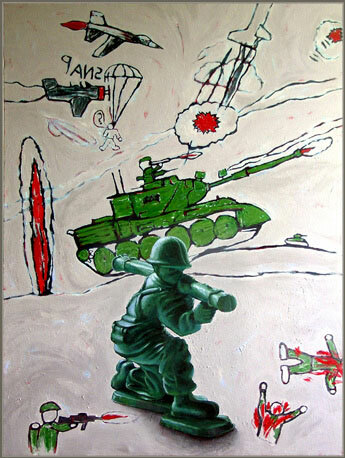 Her focus is interior landscape, but occasionally, like in this fantastic army-man painting, Pat Dumas-Hudecki mixes things up a bit by incorporating a child’s perspective on things. Takes me back to the days when I spent way too much time drawing war scenes in class. Good times. He may be a realist, but Bo Bartlett manages to simultaneously cross into the world of surrealism,in mood at least, while interpreting contemporary life. 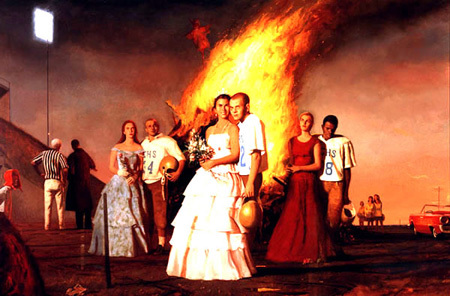 Set some time aside, his site is a fantastic look through a body of work that spans multiple decades. 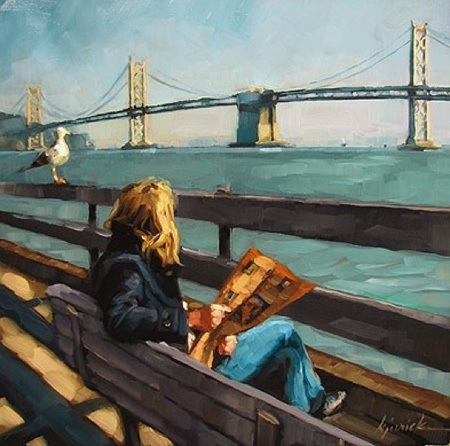 Karin Jurick strikes an incredible balance between the immediacy of her brushstrokes, and the details that are included in her works. I highly recommend a visit to her painting-a-day blog. For all the commuters out there, you’ll feel right at home going through Hannah Cole’s work. 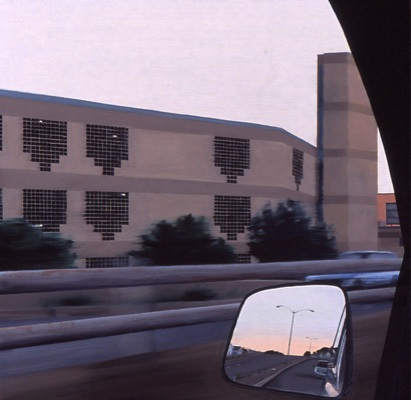 The future of the automotive industry may be in question, but there is no denying how big a role cars currently play in our society, and Cole’s paintings are a great reminder of just how much of our lives are spent on the road. Of course, they’re pretty fantastic paintings even if you don’t spend a good chunk of your day inside a motorized vehicle. 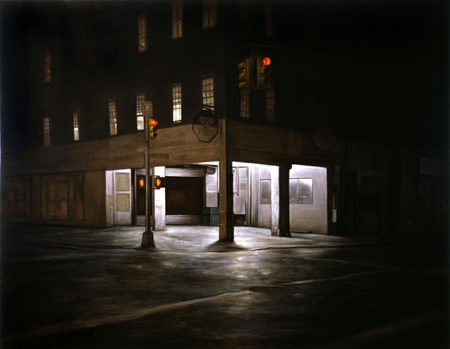 Dan Witz has a diverse body of work available for viewing on his site, including his astonishing night scenes. Incredible! 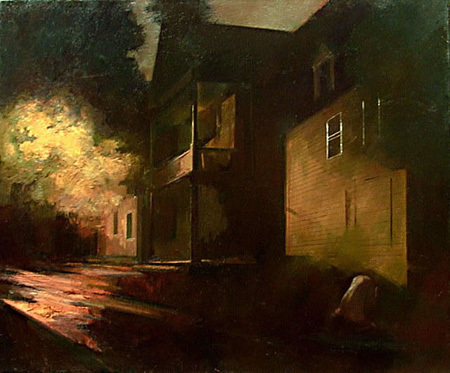 The narrative quality in Mary Harman’s work is so strong I feel like I’ve walked into a stage theatre every time I see her paintings. Great work! 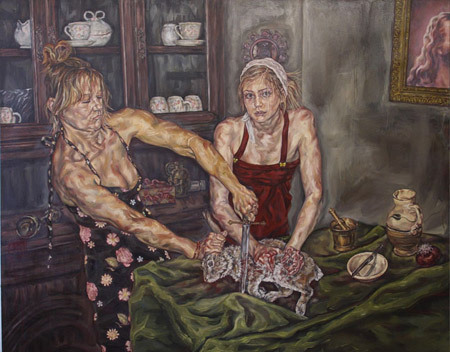 It’s difficult to pinpoint what it is about Tammy Salzl’s work that I find so compelling; her complex narratives draw me in, her approach to painting flesh is stunning, and her attention to detail is amazing. I guess you can put me down for “all of the above”. 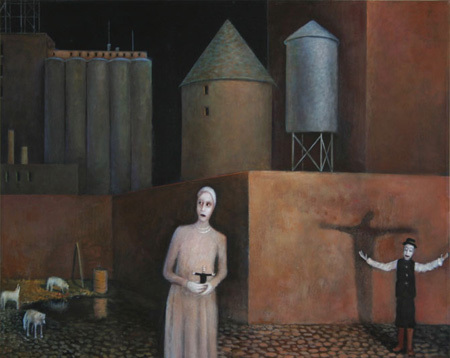 I don’t know if it’s rainy and grey out where you are, but if it is, and even if it isn’t, now would be a good time to spend time with the incredible paintings of Fritz Drury. 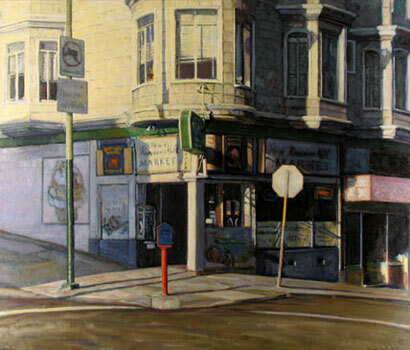 Dean M. Larson covers a wide range of subject matter during the course of painting, but for my money, his urban landscapes are the best of the bunch. Of course, I’ve always been biased toward urban landscapes, so feel free to judge for yourself.